EasySavor – Everybody can be a great chief! Everybody can be a great chief! Soak wheat, beans, and chickpeas in separate bowls overnight (7 – 10 hours before cooking). In the evening, wash the wheat, put in a pot, add water to the same height of wheat, and boil a few minutes. Wash and soak beans and chickpeas separately. The next day; get the wheat to a large pot. Add water enough to pass over 2 – 3 fingers the level of wheat, and allow cooking. Boil the bean and chickpeas separately. Wash the apricots, cut into very small slices, and soak. Wash the raisins and soak in the water. Add boiled and drained beans and chickpeas to the softened wheat. Add salt and rice. 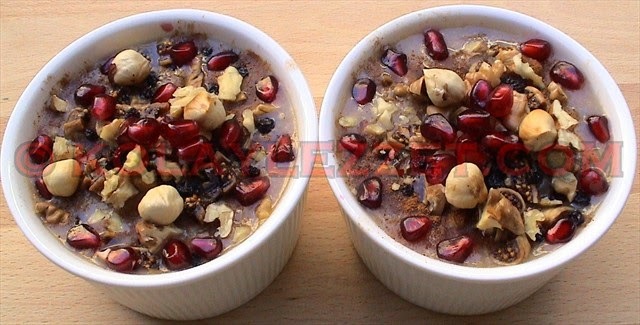 When all the ingredients in the pot are thoroughly softened, add drained raisin, drained apricot, finely chopped dates. The water of ashura is controlled. If it is too solid or not liquid enough, add the boiled water. As it nears to be cooked, add persimmons. As its viscosity indicates that it cooked, turn off the cooker. But if desired, a tablespoon of rosewater suitable for food can be added just before turning off it. After 5 – 10 minutes elapsed, add honey and stir. Pour it into the bowls as it hot. 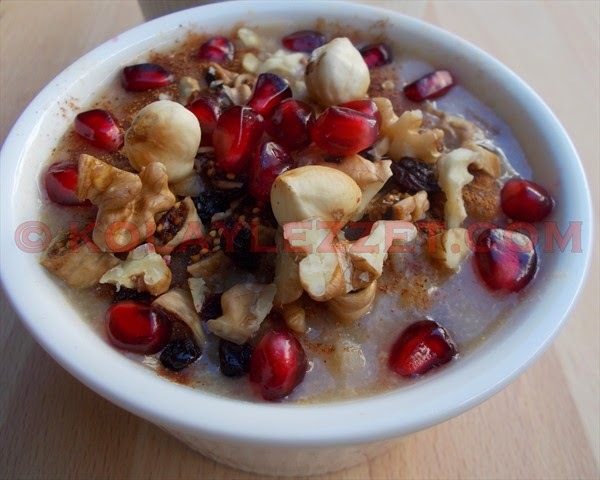 After cooling, the Refined-Sugar-Free Ashura is bedecked with optionally cinnamon, currants, walnuts, pomegranate seeds, finely chopped dried figs, and nuts.